Regional Development Australia Central Coast (RDACC) is urging all major stakeholders to work together to keep the NSW Government’s $4.6M contribution toward a permanent coastal pathway here on the Coast, following claims the money may be withdrawn due to project design changes. RDACC CEO and Director Regional Development, John Mouland, who was involved in the development of a business case to secure the funding for the Central Coast, is encouraging all key stakeholders to come together to find a workable solution. “Construction of a permanent coastal pathway to encourage connectivity along our spectacular southern coastline has been identified on the RDACC’s Infrastructure Priority List as a key driver for tourism and visitor attraction to our area,” said Mr Mouland. “Original research shows that the economic e¬ffect of permanent coastal infrastructure on the Central Coast visitor economy is significant, with a conservative estimate of close to 50,000 new visitors, resulting in more than $4.8 million of additional visitor spend per annum, and the creation of 67 additional Full-Time Equivalent (FTE) jobs. 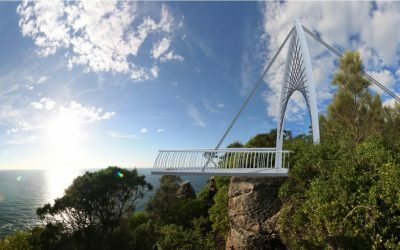 Announced at the 5 Lands Walk in June last year, the $4.6M NSW Government funding was earmarked for The Winney Bay Clifftop Walkway, an integral part of the overall 5 Lands Coastal Walkway Masterplan, prepared by Central Coast Council. Mr Mouland said extensive community consultation was undertaken in the development of the final project plan for the Walkway, incorporating prior community concerns relating to accessibility and the cultural significance of the area. “Widespread community consultation is critical to the success of any major project – and The Winney Bay Clifftop Walkway was no exception,” Mr Mouland added. “Designs were altered to accommodate initial community concerns and to create a valuable recreational and tourism asset that local community members could also enjoy and be proud of.